I don’t know what it is about the western, but I’ve always loved them. I guess it’s easy to say that – what little boy hasn’t loved playing Cowboys and Indians? The notion of a lone rider, the stranger in a strange land, the gangs of outlaws and the badge wearing posse stuck with me. I guess even four years in the Army couldn’t cure me of it. When I got out of the army and went to school, I wasn’t too sure how one went about becoming a writer. I asked a mentor of mine, Morton Marcus (who always gave me encouraging words, if not A’s), where I should go. He directed me to San Francisco State’s undergrad creative writing program. and having that all take place in Europe somewhere. If I had a nickel for every one of those stories I read throughout the program, I could buy myself a nice steak dinner. 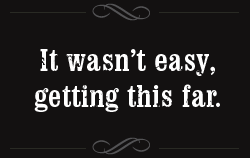 So I stuck it out – writing my westerns, but with a twist. I didn’t want to rehash Louie Lamour stories or any of the classic pulps, although I am a Lonesome Dove western kinda guy. I wanted to take the western out of it’s normal historical and geographic boundaries and place it in a different context. That’s how Strange Tales of an Unreal West came about. Strange Tales was a small printed compilation of short stories that followed the themes I was interested in. After college I decided to go on the road and sell my vision at zine and book festivals. That idea went about as far as a lead balloon. Two years and fifteen thousand dollars later, I came back to San Francisco and decided to start all over again. western for a writing contest. It didn’t get past the first round, but I learned that I could write a novel. So I worked with that original idea about an old cowboy who rode with Butch Cassidy and the Wild Bunch, and who retired to Paris in the late 1930’s. When the Nazis invade, he straps on the old six-gun for one last showdown. Everyone I pitched it too comes away wanting to know more. I knew I had a winner, so I spent over four years writing it. It wasn’t easy, getting this far. But there’s one thing I’ve learned from the western – no matter what the odds, if you got your pards by your side, there ain’t nothing that can’t be done. It’s them I want to thank. They say that history is written by the winner. If that’s true, then it’s made by both winners and losers. Folks who got caught up in times bigger than themselves and by quirks of chance or destiny, they’ve been remembered and forgotten. way to get by in a world that was changing faster then he could figure it out. It was by chance that he rode with Butch Cassidy’s Wild Bunch, charged up the San Juan Heights with Teddy Roosevelt, and traveled to Europe three times: once with Brazos Billy’s Wild West Show, the other with General Black Jack Pershing, and the last during his retirement in Paris, before the Nazis invaded. It wasn’t all champagne and sunny skies. The pain of losing his close pards and the loneliness that comes from being the last of the breed weighed heavy on his heart. But life is for the living and history is for those who have gone ahead. On a desolate boulevard in front of the Happy Flower Café, William “CATFISH” Hancock, former confederate of Butch Cassidy’s Wild Bunch, calls out six Nazi soldiers, whose conquest and occupation have ruined his retirement. Café garçon Jean Malheur watches the old cowboy gun down the soldiers as the bells of Notre Dame toll. He saves Catfish by shooting a wounded Nazi about to fire. 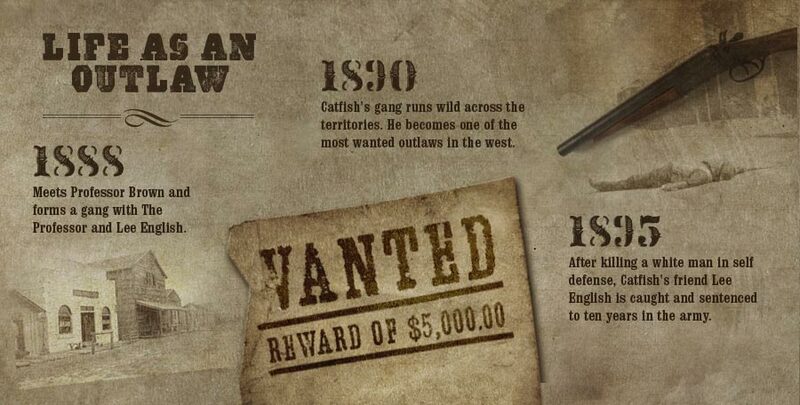 Now a wanted man, Jean flees with Catfish to Norman country. Along the trail, they pick up other desperate men on the run, forming a gang of French outlaws who take the fight to the Nazis, Wild West style. After robbing a bank in Argentan, Catfish and La Bande Sauvage head south for the Spanish border. Catfish’s thoughts turn to his pards, past and present, including one whom the Nazis have captured. He decides to return to Paris to save Hiccup. He has lived a life in which he ran away from the consequences of his decisions, and understands that he must finally face the sum of his failures. Jean accompanies Catfish with hopes of wooing Moue Bouche, the girl he left behind. Back in Berlin, the Nazi bosses aren’t happy that an old cowboy is able to put up more of a fight than the whole French army. 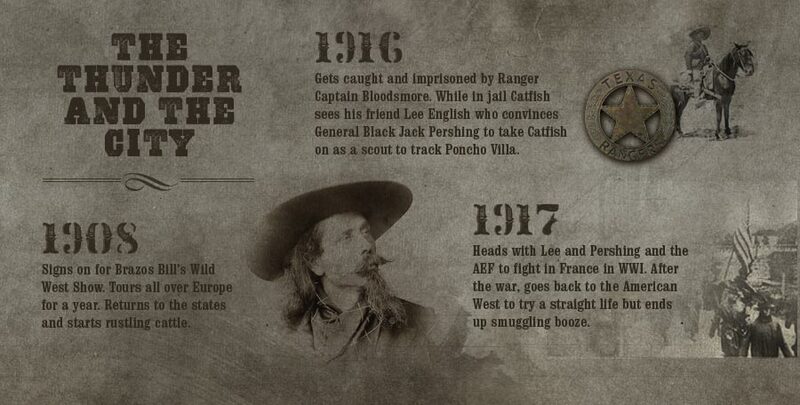 The SS send their most ruthless gunfighter, SS Major Bartholomew Schwartz, a.k.a. BLACK BART, to put Catfish down. But Black Bart shares a secret past with Catfish. 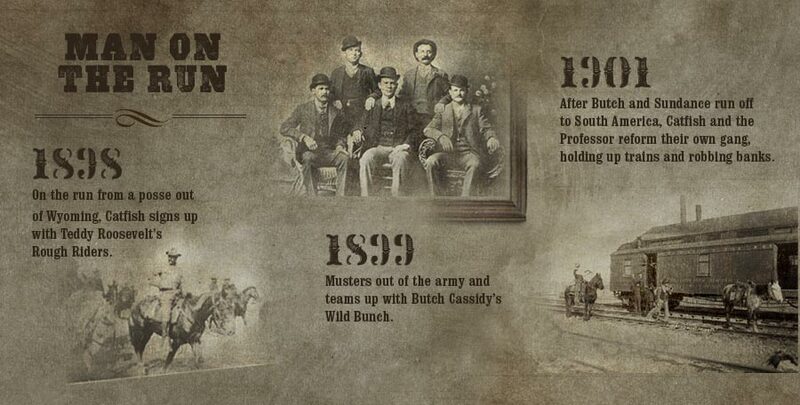 In 1908, Black Bart went and saw Catfish at Brazos Billy’s Wild West Show. Catfish took the boy into the saddle and ever since, Black Bart had dreams of becoming a cowboy. Now, in order to survive, he must kill his childhood hero, or find himself swinging from the gallows. With the help of a chanteuse spy and a pair of British agents, Catfish is able to hold up the train and rescue his pard, Hiccup. But the getaway is foiled when Moue double-crosses Jean and the gang for the love of a manipulative Communist. In the moment she betrays Jean, Moue feels remorse and realizes that she loves him. Black Bart and his SS posse track the outlaws down and surround them in an abandoned chateau. Catfish gets the others to safety but is too wounded in the gunfight to make it himself. Black Bart calls out Catfish. Catfish knows the past has caught up to him and understands what his consequence must be. The bells of the village toll noon. I'm lookin to hitch my wagon to ya to help sell Paris High Noon. So if you think the reading public is ready for cowboys killin Nazis, then this is the manuscript. 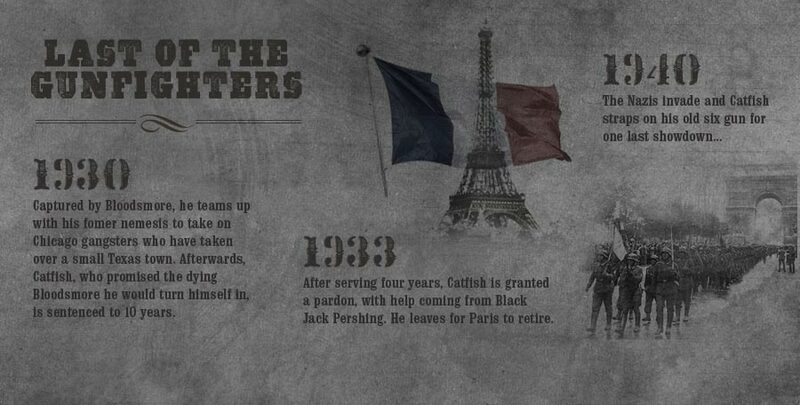 A confederate of the notorious American Wild West outlaw Butch Cassidy, he is guilty of the murder of six unarmed Wehrmacht soldiers in front of the Happy Flower Café, in the Left Bank of Paris, after the June 25th ceasefire. He is the boss of La Bande Sauvage, a gang of French criminals. Mastermind of the bank robbery and subsequent shootout that caused the death of scores of Wehrmacht soldiers. An expert shot, horseman, and tracker, Catfish has been able to elude the best efforts of Reich security and intelligence services. Do not let his age beguile you! 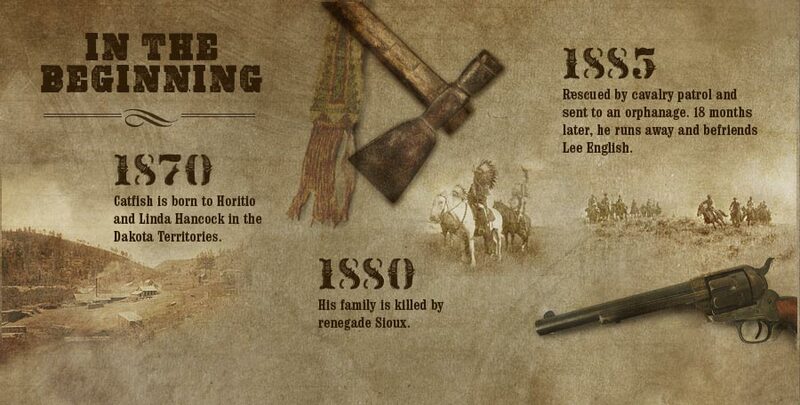 The old cowboy is extremely dangerous. Terminate on sight! The youngest member of La Bande Sauvage, Jean Malheur is one of the gang's most competent outlaw. Jean is believed to have participated in the murder of six unarmed Wehrmacht soldiers after the June 25th ceasefire, the theft of horses from Château de Médavy, and the bank robbery in Argentan. Second in command of La Bande Sauvage, Saint Jude is a career criminal in the Paris underground. Escaping after the Luftwaffe bombed Amiens prison, Saint Jude joined up with Catfish and his little brother, Jean Malheur. Wanted in connection with crimes against the Third Reich. Moue Boche worked with Jean Malheur at the Happy Flower Café, where Catfish and Jean murdered six unarmed Wehrmacht soldiers. Although she cooperated with the Gestapo investigation, she is known to associate with communists. Other members of La Bande Sauvage cannot be identified at this point, but they are all believed to be criminals, thieves, and murderers. Approach with caution! Any information on La Bande Sauvage, contact SS Major Bartholomew Schwartz, at the Place des Saussaies immediately. You are hereby ordered to proceed to Paris and take over the investigation of the American cowboy, William Hancock, aka Catfish, and his gang of French outlaws, La Bande Sauvage. Your unique talents of tracking down partisans, Jews, communists, and other enemies of the Third Reich makes you more than suited to take on this mission. It has come to my attention that you share a past with this American relic during your childhood in Bavaria. Use this to your advantage and capture or kill Catfish and destroy La Bande Sauvage. All content © 2011 Trent Tano. All rights reserved.